TabNav is an advertising-supported program that will introduce a significant increase in third-party commercial content on your browser. It is important that you remove this infection, because it might be not only annoying, but also potentially dangerous. If TabNav has found its way to your system, it is possible you have installed it unwillingly with other free programs found on third-party file-sharing sites. You should always be alert when installing freeware as it is common when additional unwanted or potentially dangerous applications are installed alongside the main programs. The distribution method is not the only thing that makes TabNav unreliable. Read this article if you want to learn more about the reasons why computer users do not delay to delete this adware from their computers. In terms of functionality, TabNav is just another generic adware app that opens up product or service ads all over your browser. 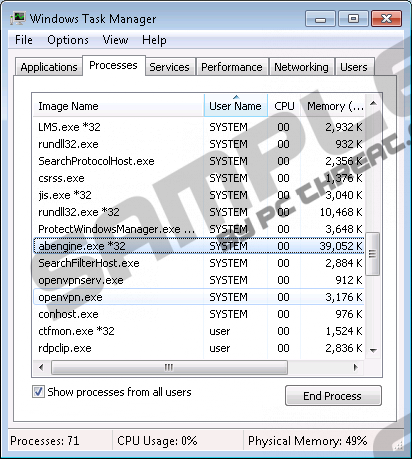 This program manifests itself as the process abengine.com*32 on your Windows Task Manager. You can check this manager to see whether this application is the reason for the unusually high amount of ads on your screen. In order to show you the most clickable commercial content as possible, TabNav also collects information about your web browsing activities. If that is not reason enough to remove this program from your system, bear in mind that the third-party ads it serves might contain corrupted links that can open up unsafe sites or initiate the download of malware infections. TabNav is an old infection that has been infecting computers for a quite some time now. It is identical to Flowsurf, another adware app that utilizes the same distribution methods and possesses the same characteristics. Both these programs do not have the official distribution source; instead, they reach systems via malicious installers that bundle freeware programs with applications or utilities that are usually avoided by computer users. If you do not want to infect your PC with TabNav, or any other adware, always opt for the advanced (custom) installation process. This way you will be provided with the opportunity to familiarize yourself with (and uncheck) all the components of the software bundle. TabNav does not have any useful features that could convince you to keep this application on your PC. Remove this adware as soon as possible, because you might never know what kind of Internet-based dangers it can expose you to. Remember, it is of the utmost importance that you complete the manual removal by running a full system scan with a reliable antispyware program. Move the mouse to the bottom right corner of your screen to open the Charm bar and choose Settings. Select Control Panel, and then choose Open Programs and Features. Choose Tab Nav in the program list and click Uninstall/Change. Click the Start button located on the bottom left corner of the taskbar and select Control Panel. Click Programs, and then go to Uninstall a program. Choose the unwanted program in the list and click Uninstall/Change. Open Add and Remove Programs. Choose the application you want to delete and click Remove. Quick & tested solution for TabNav removal.